ROJoson: I believe having a systems perspective in governance is one of the steadfast strategic objectives all hospitals should have to achieve performance excellence. 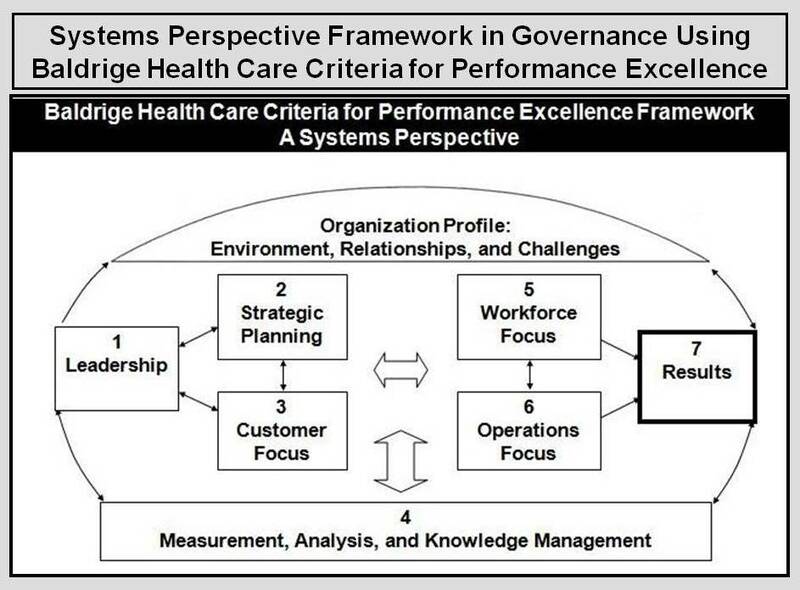 Systems perspective is one of the core values and concepts of Baldrige Health Care Criteria for Performance Excellence. There is a systems perspective approach in the governance system. What is a governance system? Governance refers to the action taken by a leader or manager or a team of leaders and managers in ensuring that the objectives of the hospital or project are accomplished. The term “governance” refers to the system of management and controls exercised in the stewardship of your organization. It includes the responsibilities of your organization’s owners/ shareholders, board of directors, and senior leaders (administrative/ operational and health care). Corporate or organizational charters, bylaws, and policies document the rights and responsibilities of each of the parties and describe how your organization will be directed and controlled to ensure (1) accountability to shareholders and other stakeholders, (2) transparency of operations, and (3) fair treatment of all stakeholders. Governance processes may include the approval of strategic direction, the monitoring and evaluation of senior leaders’ performance, the establishment of executive compensation and benefits, succession planning, financial auditing, risk management, disclosure, and shareholder reporting. Ensuring effective governance is important to stakeholders’ and the larger society’s trust and to organizational effectiveness. Governance is the process of controlling the use of assets and resources to accomplish the organization’s mission or purpose. Governance function is the set of processes customs, policies, regulations and institutions affecting the way a health care organization is directed, administered or controlled. What is a systems perspective approach? A system refers to a “whole” thing, organization, or project, consisting of parts interacting, coordinating and collaborating with each other to make the “whole” thing moves or functions as one unified entity. The parts may be people or non-people, like processes or tasks (subsystems). System refers to a set of interrelated or interacting elements. A systems perspective refers to an action characterized by simultaneously looking at both the parts and the “whole” thing to ensure that all the parts and the “whole” thing move or function as one unified entity. The Baldrige Health Care Criteria provide a systems perspective for managing your organization and its key processes to achieve results—and to strive for performance excellence. The seven Baldrige Criteria categories, the core values and concepts, and the scoring guidelines form the building blocks and the integrating mechanism for the system. However, successful management of overall performance requires organization-specific synthesis, alignment, and integration. Synthesis means looking at your organization as a whole and builds on key organizational attributes, including your core competencies, strategic objectives, action plans, and work systems. Alignment means using the key linkages among requirements given in the Baldrige Criteria categories to ensure consistency of plans, processes, measures, and actions. Integration builds on alignment, so that the individual components of your performance management system operate in a fully interconnected manner and deliver anticipated results. A systems perspective includes your senior leaders’ focus on strategic directions and on your patients and stakeholders. It means that your senior leaders monitor, respond to, and manage performance based on your results. A systems perspective also includes using your measures, indicators, core competencies, and organizational knowledge to build your key strategies. It means linking these strategies with your work systems and key processes and aligning your resources to improve your overall performance and your focus on patients and stakeholders. Thus, a systems perspective means managing your whole organization, as well as its components, to achieve success. What is a systems perspective approach in governance? The governance system or the governing body or people uses a systems perspective approach in ensuring that the objective of the hospital or project are accomplished. (Based my definition) The governance system or the governing body or people looks simultaneously at both the parts and the “whole” thing to ensure that all the parts and the “whole” thing move or function as one unified entity. 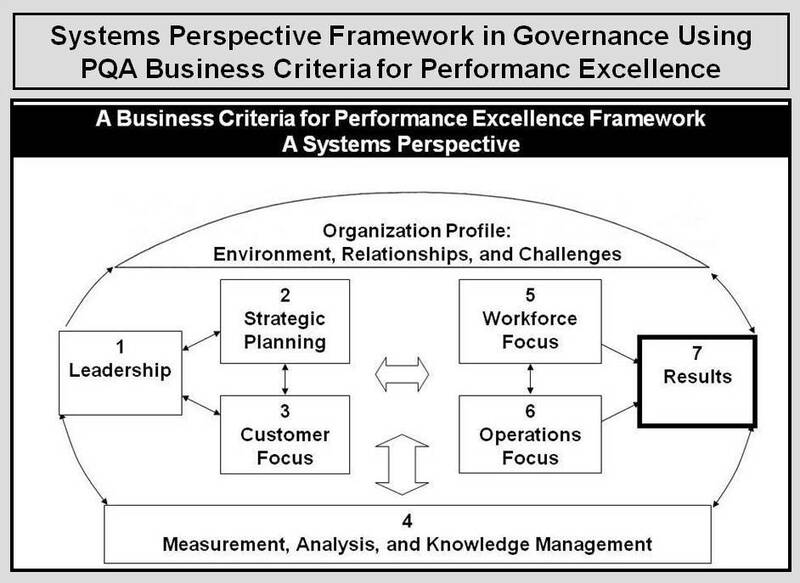 (Based on the concept of Baldrige) The governance system or the governing body manages the whole organization as well as its components, with the individual components of management system operating in a fully interconnected manner, to achieve performance excellence. In other words, the governance body or people view the operations of the hospital, departments, and projects as a whole and holistically taking into consideration the importance of alignment, coordination, collaboration, integration of all the organizational components, parts, subsystems, and activities in attaining the identified goals and objectives. 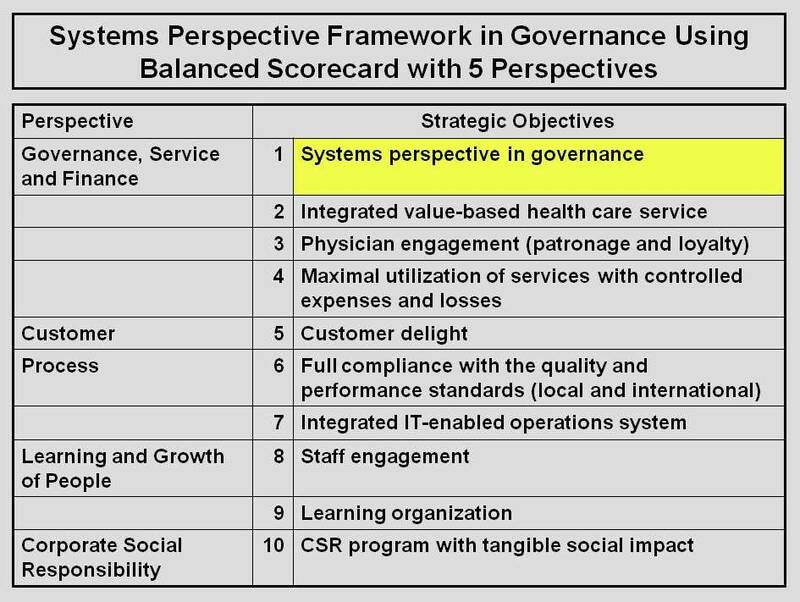 When does one say there is an honest-to-goodness systems perspective approach in governance in the hospital? 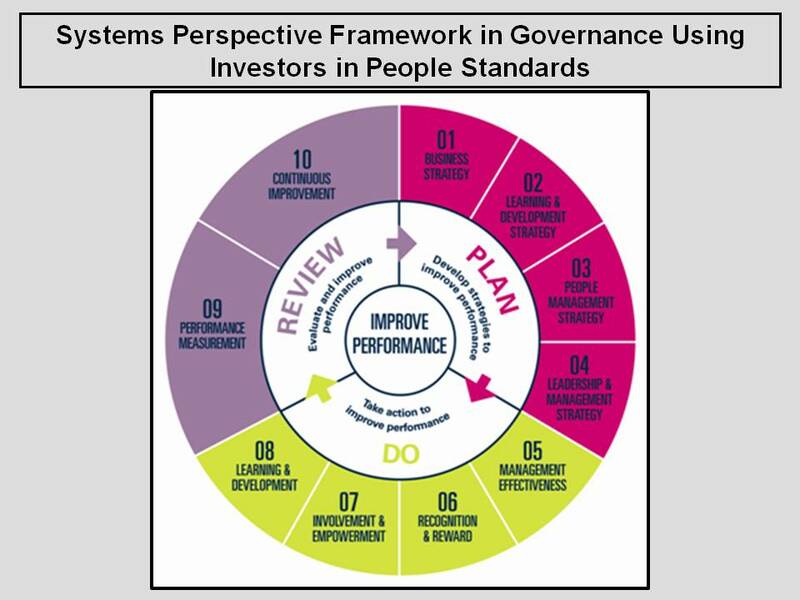 There must be evidences to show that all the members of the top, senior, and middle management and project management are using an agreed systems perspective approach in governance across and at all levels in the hospital and there is resultant positive impact on performance excellence in the hospital and its departments and projects. 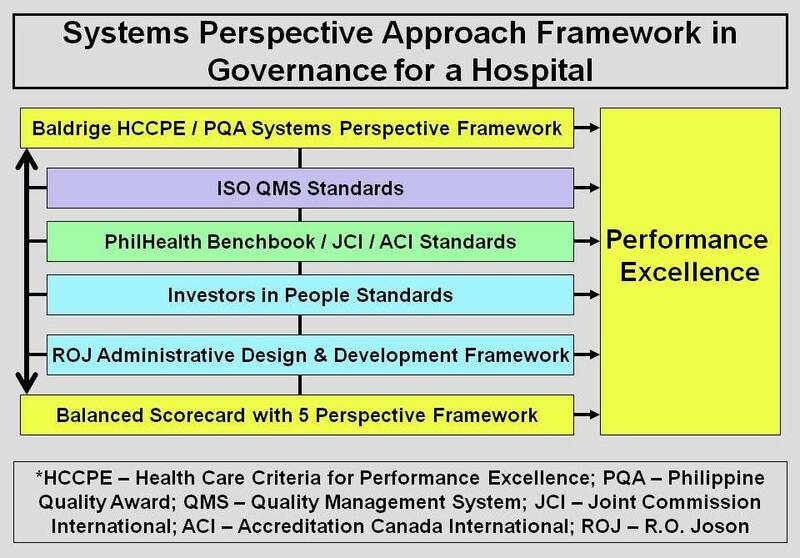 ROJoson: I believe having a systems perspective in governance is one of the steadfast strategic objectives all hospital should have to achieve performance excellence. To develop a well-defined systems perspective approach in governance that will promote performance excellence for the hospital, its departments, and projects. 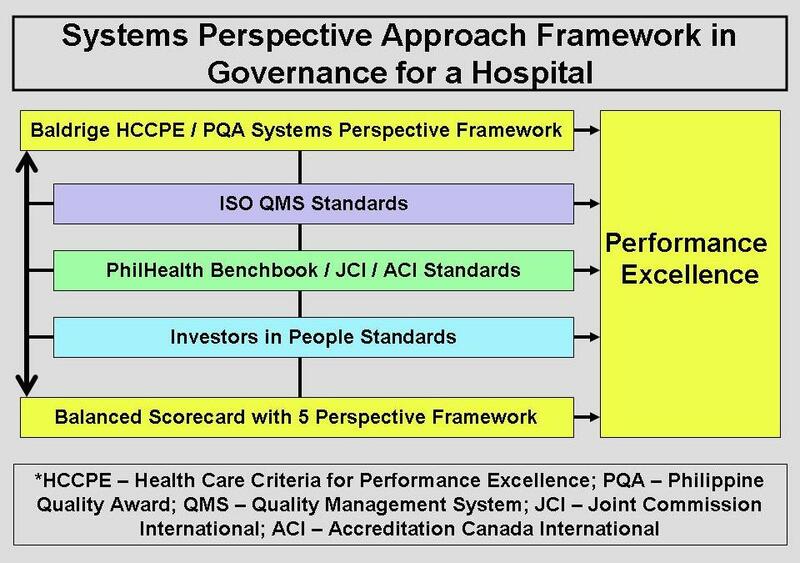 All the members of the top, senior, and middle management and project management are using an agreed systems perspective approach in governance across and at all levels in the hospital and there is resultant positive impact on performance excellence in the hospital and its departments and projects. 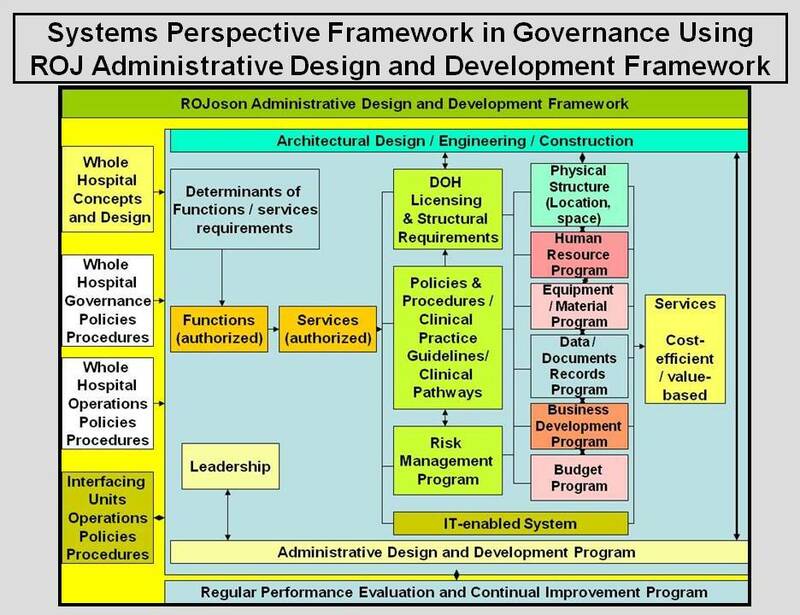 To formulate a master design and development plan on establishing and developing a systems perspective approach in governance in the hospital. To evaluate and continually improve the master design and development plan, particularly the agreed systems perspective approach framework, to ensure sustainable achievement of performance excellence for the hospital. 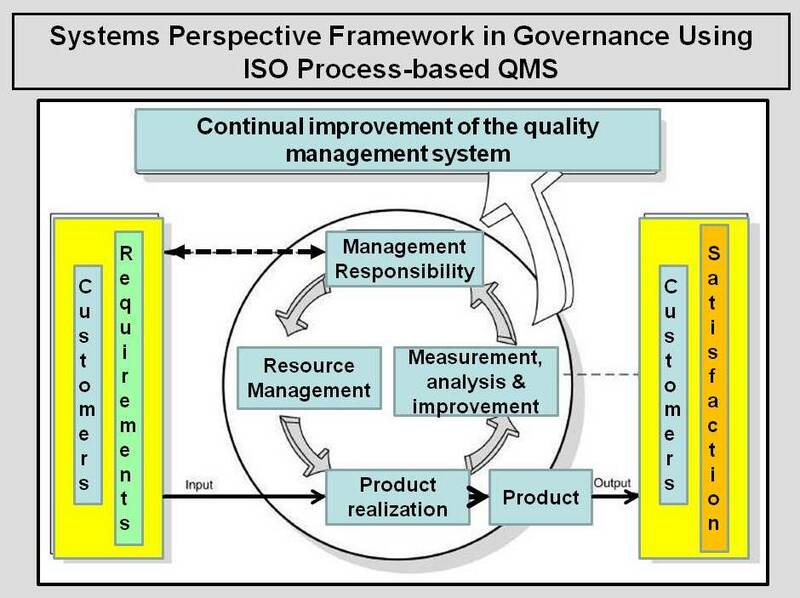 This entry was posted in Systems Perspective in Governance. Bookmark the permalink.